New trials to evaluate the optimum intervals for Primo Maxx application have concluded that Growing Degree Day (GDD) calculations used by greenkeepers in the US are too simplistic and imprecise for use in the UK and northern Europe. Recommendations that have advocated treatment when the cumulative GDD reaches 200 may have proven effective in the consistent temperatures and day length of US golf courses, but have limited value where conditions are cooler, warned Syngenta Turf Technical Manager, Dr Simon Watson. Furthermore, variable day length and different UK turf grass species require a more flexible approach, he advised. He cited that, with the UK's variable temperatures, the 200 GDD interval could be four to seven days longer in Scotland over the summer, compared to the south of England, for example, - which would lead to extend Primo Maxx intervals. However, at the same time, longer summer day length and more available moisture in Scotland could make growing conditions more favourable, which would require more frequent treatment to retain full regulation. Even within a few miles, the different conditions between a moisture retentive parkland fairway and a sandy links or downland course would require a different tailored approach to growth regulator use, advised Dr Watson. Ahead of new research on Primo Maxx to relieve stress and enhance turf health - to be revealed at BTME in Harrogate later this month - he reported results of trials by Bioforsk which demonstrated a far more complex interaction of temperature, day length and dose rate that all influence the duration of turf grass regulation following PGR treatment. Undertaken in controlled conditions at the Nordic Stavanger turf research centre, the trials evaluated Bentgrass turf growth and regulation performance combinations at temperatures of 13, 19 and 25°C, with day lengths of 10, 15 or 20 hours a day and Primo Maxx fairway rates of 0.8 or 1.6 l/ha. Overall, Primo Maxx use reduced clipping rates by an average 24% at the lower rate and 43% at the higher rate, compared to untreated - with corresponding reduction in daily leaf height growth. Dr Watson pointed out that at lower temperatures the day length had a significantly greater effect on growth rates, compared to warmer temperatures. Dose rate also had a significant effect, which is not taken into account within the US model. "Previous UK trials and greenkeepers' experience of using Primo Maxx across Europe has highlighted soil temperatures are the key factor in dictating the start to treatments on greens, tees and fairways," he advised. "Proactive programmes can then be tailored through the season according to the interaction of factors that dictate growing conditions in practice." Dr Watson cited factors such as moisture availability and nutrition that influence growth rates, with the need to alter Primo Maxx application rates and intervals accordingly. "Temperature is one factor in the calculation, but there are many other influences involved. 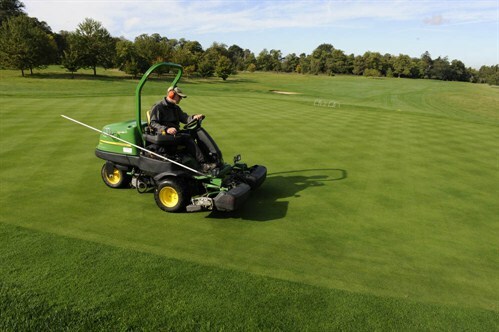 "Greenkeepers should assess growth rates by monitoring clipping yield and visual effects on the turf to develop a more flexible and effective programme through the season," he advised. "The aim is to maintain even and constant regulation to minimise fluctuations associated 'bounce-back' of growth, which can ultimately optimise turf health and playing conditions. This cannot be reliably achieved when governed by GDD alone." Further research trials will now seek to evaluate optimum Primo Maxx application intervals under natural daylight and at rates used on greens and tees. 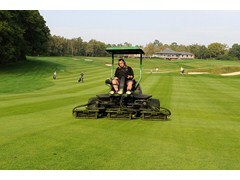 The work will provide further practical advice truly applicable for course conditions in the UK and northern Europe.